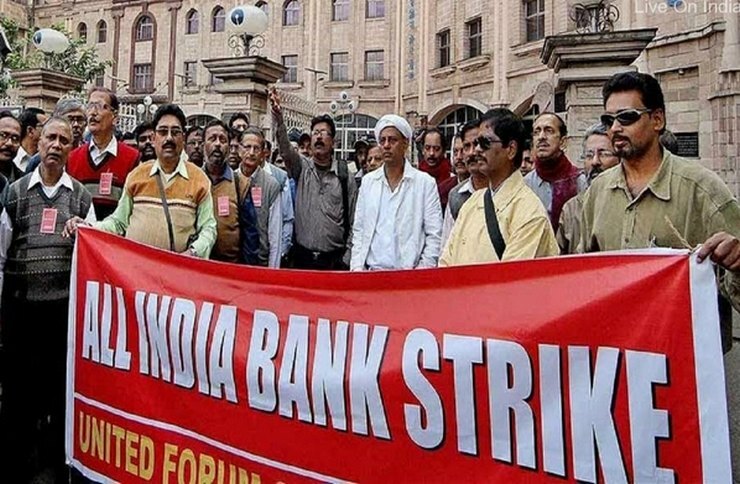 Hyderabad: About 10 lakh bank employees and officers across the country participated in the one-day All-India Bank Strike on Wednesday to protest against the Union Government's recent decision to merge Bank of Baroda, Dena Bank and Vijaya Bank, thus closing down two Banks. The strike call given by an umbrella organisation of nine unions of United Forum of Bank Unions (UFBU). He said in these three banks---- BOB, Dena Bank and Vijaya Bank, there are 9000 branches. It is certain that thousands of branches will be closed after this proposed merger. India wants more branches. When ATMs are getting closed, if branches are also closed, banking customers will find it extremely difficult to do their banking business. The top Union leader said the response to the strike is 'very enthusiastic'. Reports reaching us from all the States that the strike has been successful. Clearing operations will be affected today because branches are closed and cheques cannot be sent for clearance. Cash transactions are also affected because branches remain closed. Government treasury operations, import and export bill negotiations, money market operations, etc. will also be affected. About 30 lakh cheques worth about Rs 23 lakh crore will be held up without clearance due to the strike, Mr Venkatachalam said, adding, ''Our intention is not to disrupt banking services. But we want to draw the attention of the people and Parliament which is in session to understand the implications of the unwanted merger of Banks.'' ''Despite our protest, the Government wants to proceed with the merger. Hence the strike call was given,'' he added. The AIBEA General Secretary said the government wants to divert nation's attention from the increasing bad loans. We want Government to take tough action to recover bad loans. If loans are recovered all Banks will be more profitable. Already all the 21 Government Banks are in Operating Profit ( Rs. 1,55,000 crore as on 31-3-2018). Only because of provisions for bad loans (Rs. 2,30,000 crore), the Banks are in net loss of Rs. 85,000 crore. The government should review their policy. ''We thank all the bank employees for their support to the strike,'' he added. ''We regret the inconvenience caused to the general public due to this strike but the strike became unavoidable because the Government did not respond to our strike notice to discuss the issue,'' Mr Venkatachalam said. The nine bank unions of UFBU, which is taking part in the strike are--- AIBEA, AIBOC, NCBE, AIBOA, BEFI, INBEF, INBOC, NOBW and NOBO. After the UFBU had served strike notice, Additional Labour Commissioner Rajan Verma from Union Ministry of Labour had convened a conciliation meeting in New Delhi on December 20 in which representatives of UFBU, Indian Banks Association/AIBA, Ministry of Finance and from Bank of Baroda, Dena Bank and Vijaya Bank had participated.